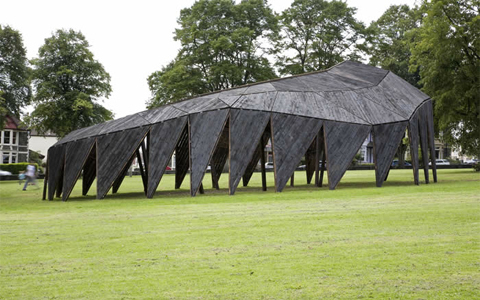 Artists Heather & Ivan Morison, in collaboration with architect graduate Alex Sash Reading, designed a temporary structure called The Black Cloud, situated in the Victoria Park in Bristol, UK. 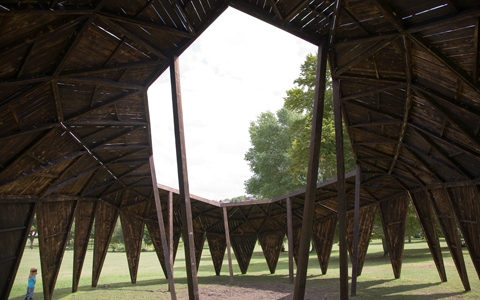 The structure is a deconstructed geodesic dome, made up of 152 unique timber triangles, creating a form that appears to lurch across the park. The Black Cloud will remain in place over the next months hosting programmed events, as well as events by local residents and visitors.